Why is it so hard to close down Victoria’s dirtiest #coal power Stations? Greens MLA Ellen Sandell made a statement to parliament during the morning (see bottom of article) calling on the Labor Government, led by Premier Daniel Andrews, to step up on climate action and phase-out these two ageing and very polluting power plants. But the present Labor Government has been conspicuously silent on the issue. Why do I say again? Because between 2010 and 2012 there was a concerted campaign at both the State and Federal levels to get Hazelwood power station closed down. Labor Premier John Brumby campaigned in 2010 for the phased closure of Hazelwood although activists wanted total phaseout. During the years of the federal Labor Government, Labor Member for Wills Kelvin Thompson worked to get a compensation package as part of the Carbon pricing package, but negotiations with International Power (now owned by GDF Suez) were ultimately unsuccessful with, by then, a hostile Liberal state government in power which stopped discussions on power station closure and compensation by May 2011. More recently I wrote about the Surf Coast campaign to close Anglesea in 2014. Climate analyst and activist David Spratt highlights in a recent post on the necessity to close Hazelwood that "89% of Australia’s coal power station fleet is sub-critical, by far the most carbon-intensive sub-critical fleet in world", and that the "International Energy Agency calculates that one in four of these sub-critical plants must close within five years, if the world’s governments are to keep their pledge to limit global warming to 2C." Hazelwood and Anglesea are prime candidates for closure. So why isn't the State Labor govenment acting? 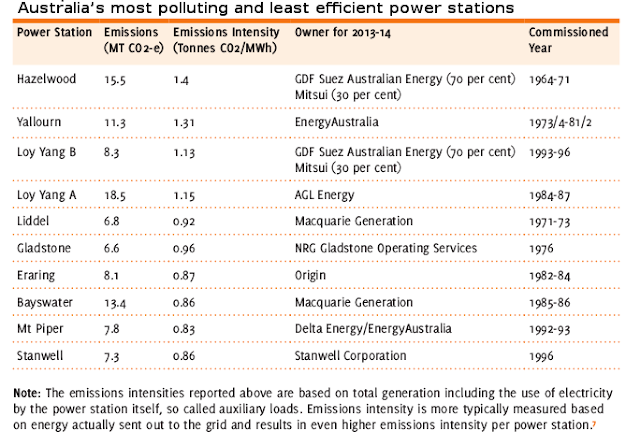 A March 2015 Australian Conservation Foundation report Australia’s top 10 climate polluters (PDF) listed Hazelwood at the very top of the list of Australia's most polluting and least efficient power stations. Even worse, according to the OECD, it is one of the worst in the developed world, both in regard to the toxic cocktail of chemicals it daily emits into the air and water, and the carbon emissions intensity it spews into the air of the La Trobe Valley. Carbon emissions are currently 15.5 MT CO2e per year, with carbon intensity of 1.4 Tonnes CO2/MWh. Just this one facility produces about 15 per cent of Victoria’s total carbon emissions. The power station is also a major consumer of water: 1.31 megalitres of water is consumed per gigawatt hour of power generated. The rally on the steps of parliament was organised by Adam Bandt's office, the Federal Greens MP for Melbourne. It was also advertised through climate change networks including Climate Action Moreland who ask Why is Australia’s dirtiest Power station still operating?. The rally heard from both Adam Bandt and Ellen Sandell, as well as Dr Colin Long from the NTEU, and Tom Doig, a journalist who has written a book - The Coal Face - on the 2014 mine fire that brought choking ash clouds over Morwell for more than a month. A statistical analysis of deaths for the period revealed that 11 people are likely to have died due to the contribution of conditions from the mine fire. That is an awful lot of chemicals including over 4 million kg of 10 micron particulates, and 600,000 kg of 2.5 micron particulates, 343,139 kg volatile organic compounds. Sulphur dioxide, hydrochloric acid, lead, arsenic, cadmium, mercury, none of it good for our health. According to NPI emissions data for Anglesea, Sulphur Dioxide (SO2) emissions are 43,304,208.86 Kg per year, or 43.3 tonnes. Sulphur Dioxide is a major health irritant and mixes with water vapour to form acid rain. Why do we sanction this level of chemical emmission when the power is simply not needed? The Climate and Health Alliance (CAHA) estimated the costs of health damages associated with coal combustion for electricity in Australia amount to $2.6 billion per annum. It is a social cost that falls particularly heavily on communities like Morwell in the La Trobe Valley, or in the Hunter Valley with substantial coal mining and coal fired electricity generation, but every tax payer bears some of this expense through taxpayer support of the public health system. It is, in effect, a $2.6 billion subsidy for the coal industry, on top of approximately $10 billion in Federal Government subsidies to the fossil fuel mining industry every year. Read the Climate and Health Alliance (CAHA) report: Coal and Health in the Hunter: Lessons from one valley for the world for a full appraisal of the health impact of coal in one region. There is at least 2000MW spare capacity in the Victorian grid, so we should ask why we continue to have the 1600MW Hazelwood and 50MW Anglesea power stations continuing to operate and pour toxic pollutants into the environment. This directly affects the health of people that live in the vicinity. It seems like succeeding government's have been negligent in duty of care both in terms of proper regulation of environmental pollution which has a long term impact on climate, and toxic pollution which impacts population health, including contributing to increased rates of death. Perhaps we will eventually see class action cases being brought for climate inaction against government, in their failure to regulate and act, based upon human rights law framework. A case brought against the Netherlands Government by 896 Dutch citizens was recently heard at The Hague with a final verdict expected on June 14. A similar case is already being prepared in Belgium, and cases in the United Kingdom and Spain are in the early stages of preparation. 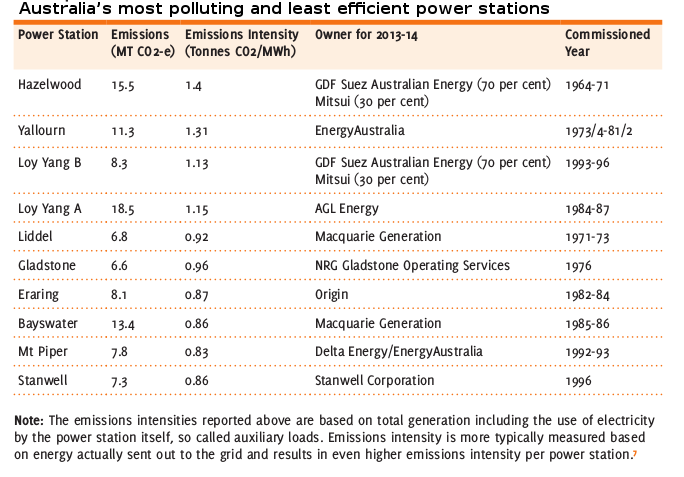 Ms SANDELL (Melbourne) — I raise the matter of Australia’s dirtiest power stations at Hazelwood and Anglesea. Hazelwood is Australia’s dirtiest power station and the third most polluting power station in the world. There is now surplus energy in the grid, equivalent to five Hazelwoods, so why is it still operating? If this government is serious about climate change and leading on renewable energy, why is it not acting now to shut down Australia’s dirtiest power station? If this government is serious about investigating the 2014 coal mine fire, how can it ignore the everyday health impacts of regular operations at Hazelwood? If the government is serious about standing up for workers, how can it risk leaving them stranded without a plan when Hazelwood’s owners switch off an unprofitable and degraded asset? The government has a choice. It can leave the workers of the Latrobe Valley and their families without jobs when the company locks up and leaves, or take leadership now by replacing Hazelwood and proactively developing a community-led transition plan that the Greens are calling for. Today at 12:30 p.m. a crowd will gather on the steps of this building to show the government that Victorians are serious about replacing Hazelwood and Anglesea. I am here to tell the government that it should be serious about it too. We are here to remind the government that in 2010 Labor had a plan to phase out Hazelwood, and it should stick to that promise. No government can claim to have a credible climate change policy unless it has a plan to phase out coal-fired power. The government must prove that it means what it says about climate change. Coal-fired power stations must go, and Hazelwood and Anglesea must be the first to go.